For my redesign, I wanted to incorporate elements from all of her experiences, as Spoiler, Robin, and Batgirl. The Spoiler elements include the full face mask, hood, cape, messenger bag, and pouch-heavy utility belt. I mixed the color schemes of her Spoiler and Batgirl costumes, and used the scalloping of Batgirl’s cape and the ribbing on the sides and insides of the arms reflects (and nearly matches) Stephanie’s recent Batgirl costume. The Robin elements I included was the tunic-style top and the stitching down the front of it (only i made it purple instead of yellow). I wanted it more off-center, like an imperial coat. The gloves and boots are an amalgam of all of these things, still allowing for the bat-like ridges. and i made them finger gloves because…well, I just like finger gloves layered over gloves I guess. 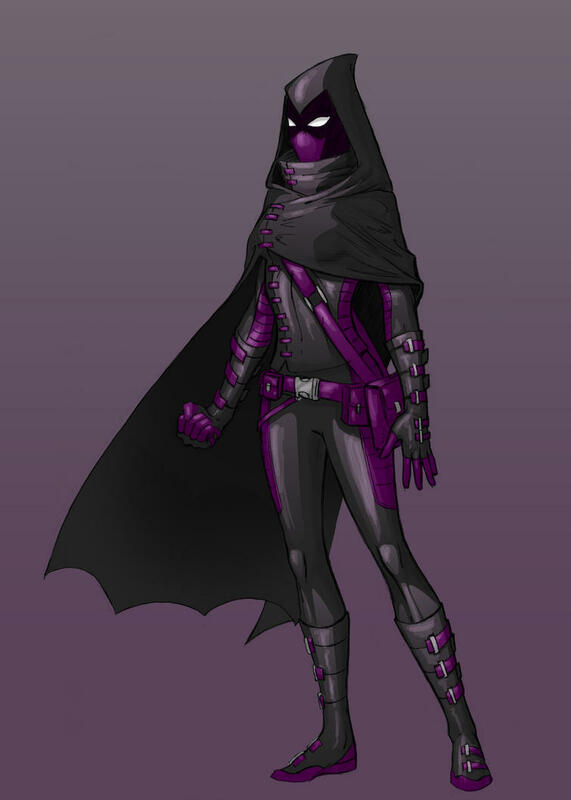 In terms of color, I felt for the Bat-world, black and purple worked much better in connecting her to Batman’s crew than purple and blue. Also, removing the blue further removed her from her villainous father, Cluemaster. The one fault of the costume would be the lack of mobility if the cape was clasped like it is shown above. Althouth, in theory, she could just undo a couple of those clasps and be free as a bird. And there we have it. I feel like I came up with a functional costume that properly represents the past and present of Stephanie Brown, THE SPOILER! What do you think?? This entry was posted in Batgirl, Batman, Gotham, Robin, Uncategorized and tagged Bat-Family, Batgirl, Batman, Gotham City, Robin, Spoiler, Stephanie Brown.